Since no new material is introduced during third term, the final exams of first term are considered to be “midyear exams.” For years 9, 10, and 11, midyear exams are standardized across the Congregationalist Church schools, and so they are administered in a very official style. Years 12 and 13 are only standardized at the end of the year, but they are still given schoolwide midyear tests. Each day this week is divided into two subjects, so the entire school takes a test on the same subject for their respective year before interval and another after interval. For example, this morning the entire school took year-specific English tests before interval, and religious knowledge tests after interval. For unknown reasons, my proctoring schedule is quite a bit lighter than some other teachers on staff, so this morning was my first assignment. 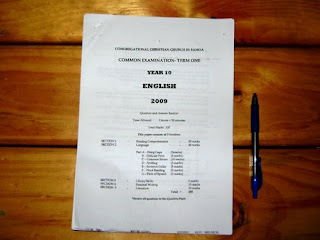 I administered the English test to the 10.2 kids. I don’t teach any year 10 classes, but I do see a couple of the 10.2 kids regularly, so I was familiar enough. Though the testing structure is very official, things become much more unofficial in practice. This isn’t The States. There are no Scantron sheets. There’s no script to read before tests are distributed. No “make your mark heavy and dark.” And while the cover of the test said that students should be allotted 150 minutes, most other teachers collected tests a good 30 minutes early. I’m thinking about asking if I can take an English class next year. I think the variety would be appealing, and I can also start transitioning the other computer teacher into teaching more of the computer classes. And while I don’t think today gave much of an accurate preview of what it would be like, it gave a little bit of the flavor. Though I don’t currently teach the subject, I offered to answer any questions about English before I distributed the tests. “You know, I speak English,” I told them. “I’d probably do really well on this test. So you can ask me whatever you want before I hand it out.” They were not interested in this offer. Tests are written by teachers in the school system. 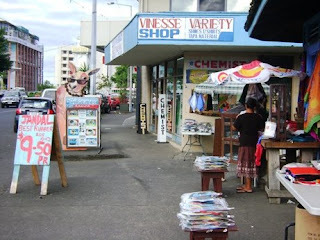 Year 11 students across Samoa are taking my Computer Studies test tomorrow. I stole a bunch of questions from past volunteers. I think most teachers get questions from other places. I’d be curious to hear where this teacher got materials. On the reading comprehension part, different passages included sentences like “I really enjoyed the fortnight I was there” and “The play was enjoyed by the Congregation as much as those who acted it.” Do people really use the word “fortnight” anywhere in the world? I thought it was phased out in The States around the time of the Rutherford B. Hayes administration. One kid raised his hand and asked what “multitude” meant in a particular passage. Out of sheer curiosity, I turned the page, and the next question on the test was “What does multitude mean?” Nice try, Slick. In Oakland, I learned that students will work on the test as long as it is out, even if others have finished and are in the room fooling around. But the minute you start letting the ones go who have finished, the ones who are still working have too much incentive to quit. So I held the finished kids. They became difficult to control. I had been twirling my pen for much of the time I was in the room, and at one point I looked out and saw no less than 10 students trying their own hand at pen twirling. Many of them smiled at me, their pens flying across the room. I let them go after 144 minutes. 2 stuck around to finish. I was happy about that. Tomorrow I’m proctoring my year 11.1 class while they take my test. I expect it to be a different beast all together. I hope this post was enjoyed by readers as much as he who authored it. Pictures below. 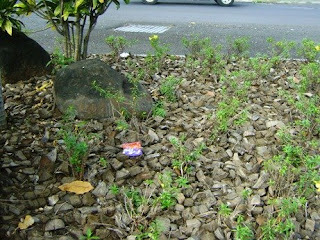 Today I noticed this island (of the street variety rather than that of the ocean) is not covered in tanbark, but rather coconut shards. I also noticed that one leg of this tent is being held with a cinderblock and the other is being weighted by coconuts. They are a miracle fruit. 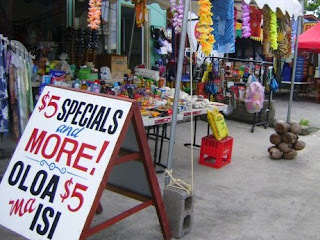 I have nothing to say here, except I find this to be one of the more colorful storefronts in Apia. Although the color got washed out of this picture a lot. Sorry about that. Nothing to say here either, except I felt like taking a picture of it today. That's the Methodist bookstore on the bottom floor. 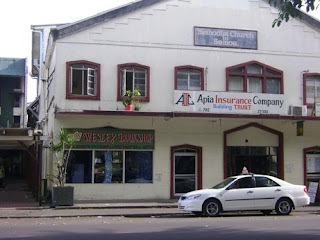 Religious bookstores are the only variety of bookstores in Apia.